This baseball film from Thomas H. Ince emphasizes small-town values and staying true to your roots as ideals, just as many films about “the Great American Pastime” would do in years to come. It features a young Colleen Moore as the love interest, still a few years away from becoming the national symbol of “flapper” fashion. This short film from IMP (the predecessor to Universal Pictures) is a simple morality tale about a philandering husband’s comeuppance. It is probably known today mostly because of starring a young Mary Pickford along with her then-husband Owen Moore. This big-budget release from Thomas Ince is a famous anti-war spectacle, which reproduces the horrors of the First World War in a plea for brotherly love. While it is big on message and visual drama, it is relatively short on plot and character development. The story takes place in the fictional country of “Wredpryd,” with much of the action in the capitol, “Nurma.” These places look extremely Central European, so that audiences can be forgiven for misting them for Germany. The King of Wredpryd (Herschel Mayall) believes that war makes a nation great and strong, and his military advisers are urging him into belligerence. Parliament takes up the question for debate, and one man, “an ardent follower of Christ,” dares to oppose war on humanitarian grounds. Onlookers boo his cowardice and throw things, and the Ministers override him and pass articles of war. The King accepts these with pleasure, and calls for Count Ferdinand (Howard C. Hickman), “an inventor in the service of the King.” It is never entirely clear what Count Ferdinand invented, but later we get the sense that it has to do with submarine warfare. Count Ferdinand is in love with a common woman (Enid Markey), so the King promises him dispensation to marry whomever he likes, so long as he devotes his services to the war effort. The Count eagerly agrees. Soldiers parade proudly through the city to the universal acclaim of the populace, but the member of parliament who spoke out against war is present, and decries the sacrifice of young men. This arouses the crowd, and soon there is a riot as he is attacked for his unpatriotic sentiments. The Count is torn between his love for Enid and his sense of duty. He takes command of a submarine and spends his days vacillating while his second-in-command does all the work. One day an order arrives to sink a ship – “The Propatria” – which is carrying passengers but is suspected of taking ammunition to the enemy. The Count stands stunned, while the second-in-command takes over as usual, ordering the boat to surface and prepare a torpedo for the attack. The Count fantasizes the destruction of the ship, seeing women and children being dumped out of lifeboats into the cruel ocean waves. Finally, the Count springs into action, countermanding the order and saying “no torpedoes against children.” He exposes a cross on his undergarment and the men realize that he has become a pacifist. They move to mutiny against him, but he pulls out his sidearm and holds them at bay, shooting two of them when they move to disarm him. Now he opens a torpedo valve and water rushes into the submarine, which sinks and then explodes, killing everyone on board except for him. Sailors from the Propatria row out to rescue him. The war rages on and somehow he is returned home unconscious (this is never clear). The King sits at his bedside, waiting to see whether he will recover. Meanwhile, the Count is experiencing a lengthy religious vision, that involves going to Hell and meeting Jesus Christ. Apparently, he is forgiven for killing dozens of the men under his command, since he did it to save children. Christ now takes possession of his body and heals it so that he can spread the message of peace on Earth. 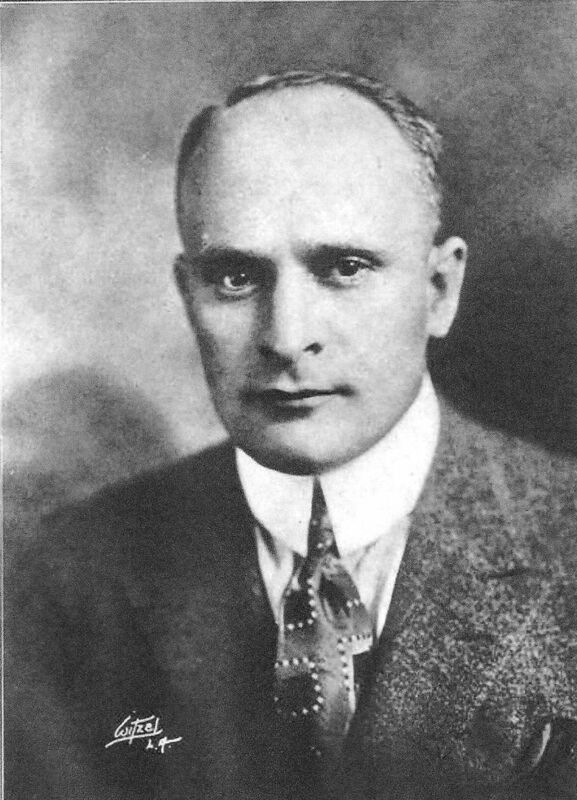 Soon after his miraculous recovery, the King starts receiving reports that Ferdinand is inciting riots and stirring up trouble in the city. Each time he speaks, angry citizens attack him. The King has him arrested and condemns him for treason. On the day of his execution, the “invisible army” of women, which now includes a phalanx of nuns, marches on the city, led by Enid. They fill the square and demand peace at any price. The King discovers that the Count has died in the night, cheating the hangman, and goes to visit his cell. There, the vision of Christ comes to him and shows him the horrors of war, that he has brought upon his people. 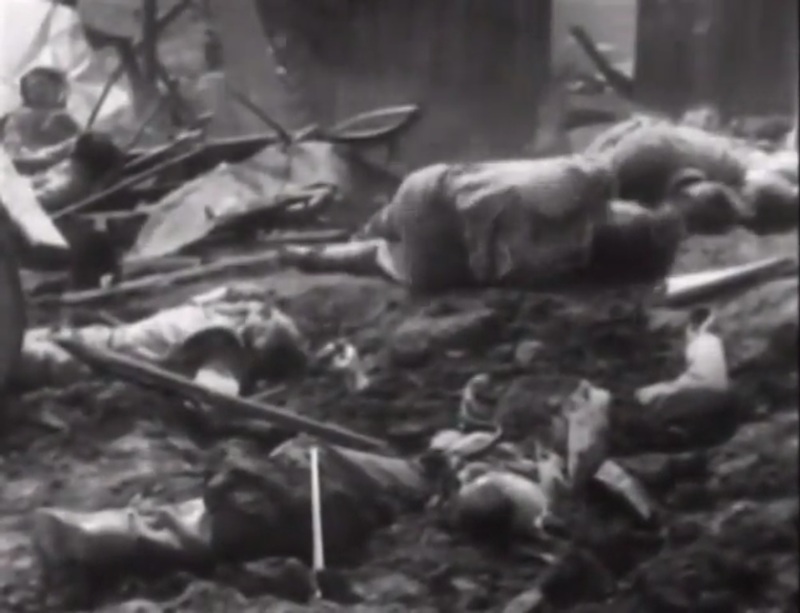 He sees men dying in the mud, devastated fields and cities, children without fathers, women without husbands. Then, Jesus shows him the book in which his name is written – “on a page stained with the blood of your people,” and the King realizes the evil he has caused. I found this movie extremely heavy-handed and un-subtle in its message. 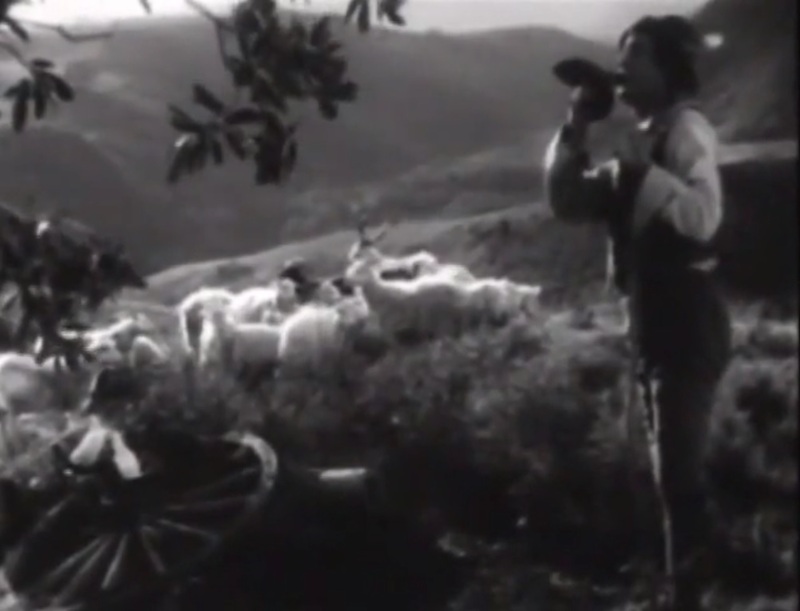 It’s possible that some of it is missing, since The Silent Era claims it runs 10 reels, which would be around 2 and a half hours, depending on frame rate, but the video is only 86 minutes. Even so, it managed to be somewhat equivocal in its pacifism. The nation depicted is so clearly Germany, and the blame for war so clearly placed on that side, that it could easily be interpreted as a call to arms against Germany, rather than a call for the Allies to lay down their weapons. 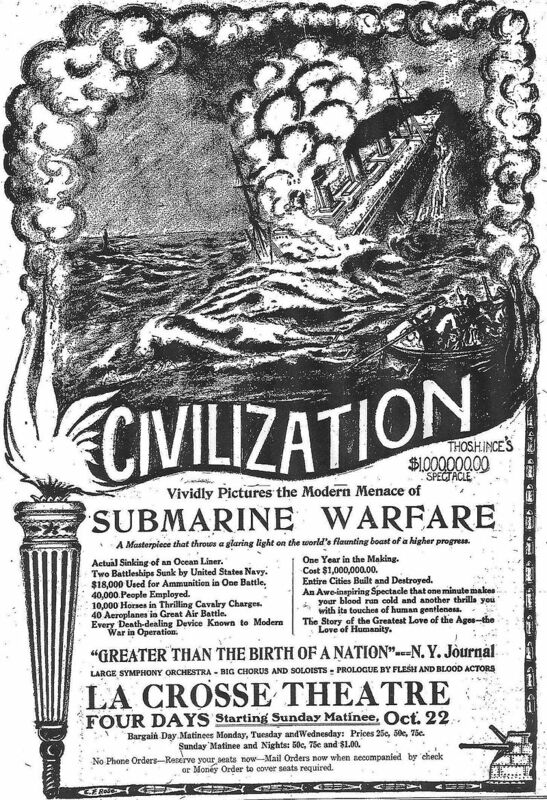 Indeed, according to “The Silent Era,” it was distributed in the UK under the title “What Every True Britain [sic] Is Fighting For.” The depiction of the Lusitania incident, which had increased belligerent attitudes in the USA, also does not seem calculated to promote non-interventionism. Apparently the Count can be forgiven for killing his own men, so surely an Allied craft would also be forgiven for destroying a German submarine to save the lives of children. Wikipedia claims that the Democratic National Committee credited this film in part for the re-election of Woodrow Wilson with his slogan of “He kept us out of war,” but I note that the source cited is a 1996 newspaper article, so this has to be taken with a grain of salt. It sounds like Ince-originated hype to me. 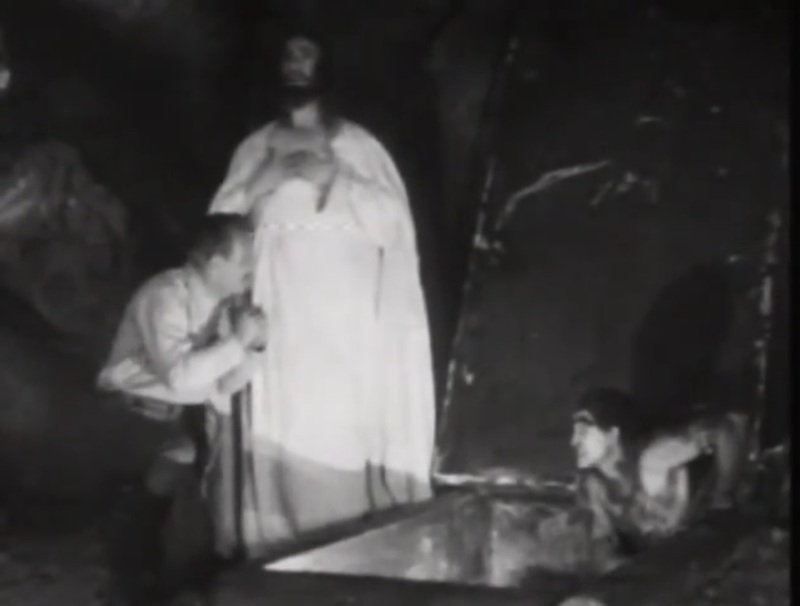 Wikipedia also makes the blatantly false claim that this was “one of the first movies to depict Jesus Christ as a character.” Apart from Alice Guy’s “The Birth, The Life, and the Death of Christ,” Charles Musser has traced the history of Passion Plays in the pre-Nickelodeon era in “The Emergence of Cinema.” One thing that is true is that such depictions have tended to be controversial in the United States in all eras. All that aside, what the story is really lacking is human interest. The battles are large-scale and epic, but not tied to the characters in such a way as to make us really care what’s going on. Our main characters spend a lot of the movie in a beatific trance. Even when they aren’t, they are given to rather broad pantomiming, as when the King tells the Count that he will be allowed to marry his love, and the Count immediately spreads his arms wide and stares up in rapture. 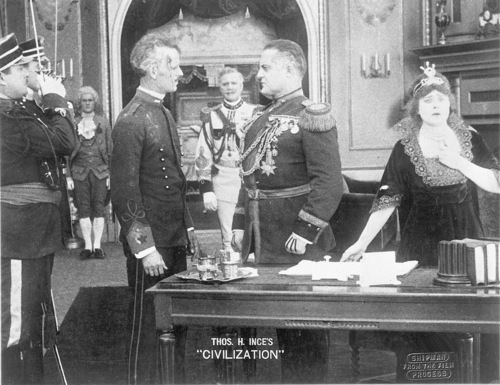 The effects, editing, and production design are all good quality, certainly compared to the average Thomas Ince production, but since this came out shortly after “Intolerance,” it’s hard not to compare it unfavorably to D.W. Griffith’s lavish production values. In no way does it measure up, even the battle scenes are frankly weak just in comparison to the previous year’s “The Birth of a Nation.” While it’s realistic that there’s a lot of smoke on the battlefield, so much is used that it tends to obscure the action, and you can’t really make a good battle scene just showing one side of the fight. 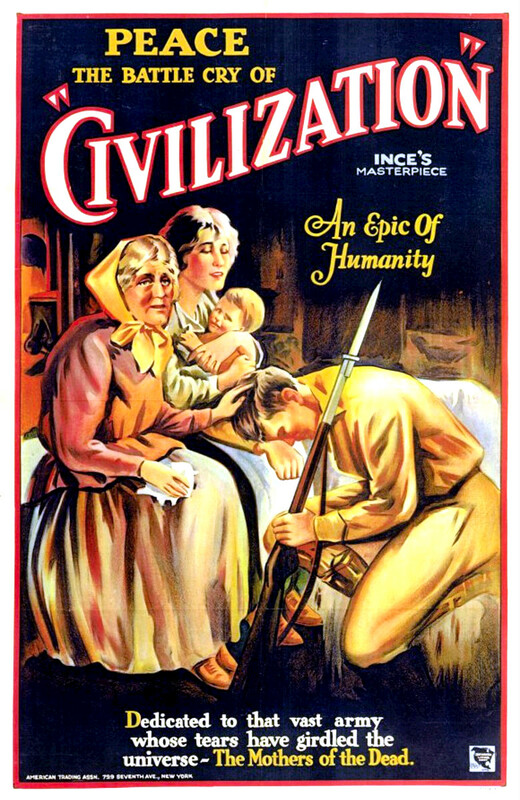 Apparently a success in its day, “Civilization” came off to me as too clumsy and blunt in its message, and not really a great example of film technique of the period. 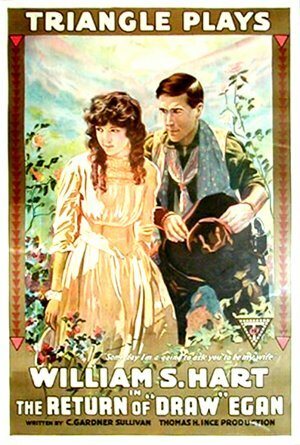 I’ve been looking forward to seeing a Western starring William S. Hart for some time now, and today I got my chance, with this famous entry from 100 years ago. 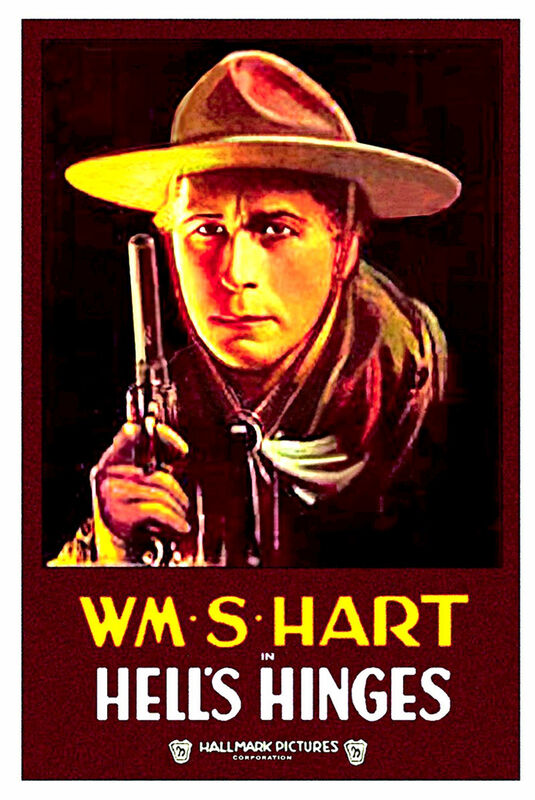 Hart is famous for being the “darker” “anti-hero” alternative to Gilbert M. “Broncho Billy” Anderson, but does this movie stand up to the hype? “Words, words, more words!” In “Sunset Boulevard,” the former silent actress Norma Desmond accuses writers of “making a rope with words and strangling this business,” but even in the silent years, what was written on the page presaged what would be seen on the screen. 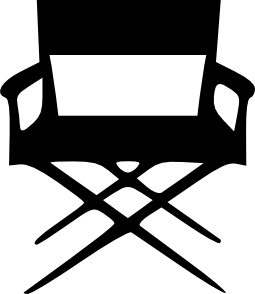 Writers are the true creators in cinema – the ones who originate the ideas that everyone else tries to live up to or adapt to their own approaches and talents. 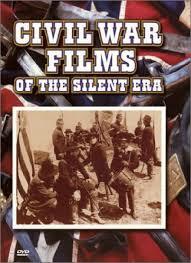 Then as now, a good story, well told in words, sets the stage for a great film. Some of our candidates for Best Screenplay are adaptations of other works, while others are “original” – to the degree that movies ever are. There were many great candidates this year, but when I looked back and asked myself, “which of these do I remember for the story, rather than images or acting,” the answer came through clearly. The story of a man coming to America full of hope, only to find hardship, crime, and injustice remains iconic, and has to be seen as bold for the time. 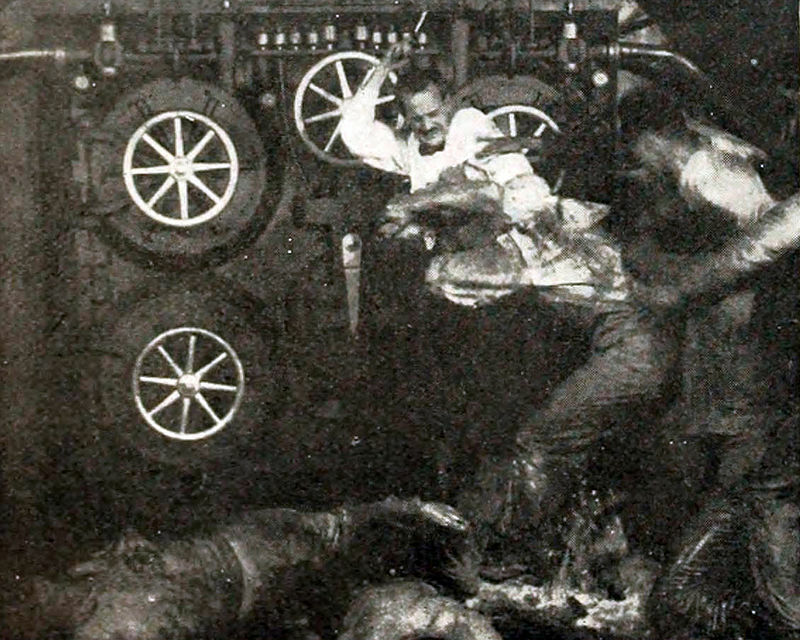 While some elements will seem melodramatic or predictable to modern audiences, that’s largely because of the impact this movie had on later filmmaking practices. The nominations for the “real” Academy Awards were announced earlier today, and once again I’ve seen none of the movies up for consideration, and have only heard of about half of them. This is a recurring theme, and there’s no reason for me to be bitter about it. I just don’t go to the movies very much, and when I do, I usually don’t enjoy it much. But…for those who are interested in my opinions of the movies of one hundred years ago, this is also the day that I announce my nominations for the Century Awards. I did a pretty good job of watching available movies from 1915 over the past year, although of course it’s not possible to see everything and I may have missed some obvious ones. I may be making some last minute additions in the next weeks, depending on how the Inter-Library Loan gods treat me. As I said last year, the rules to the Academy Awards say that there can be “up to five” nominees for each category except Best Picture, which gets “up to ten.” If you want to weigh in on the choices I’ve made, cast your “vote” by commenting, and explain why you think your chosen film should win. I’m still the final arbiter (it’s my blog), but I’ll certainly take well-thought-out arguments into account. If I sneak any new nominees in, it will mean exceeding the maximums, but I figure I can break my own rules when I need to. 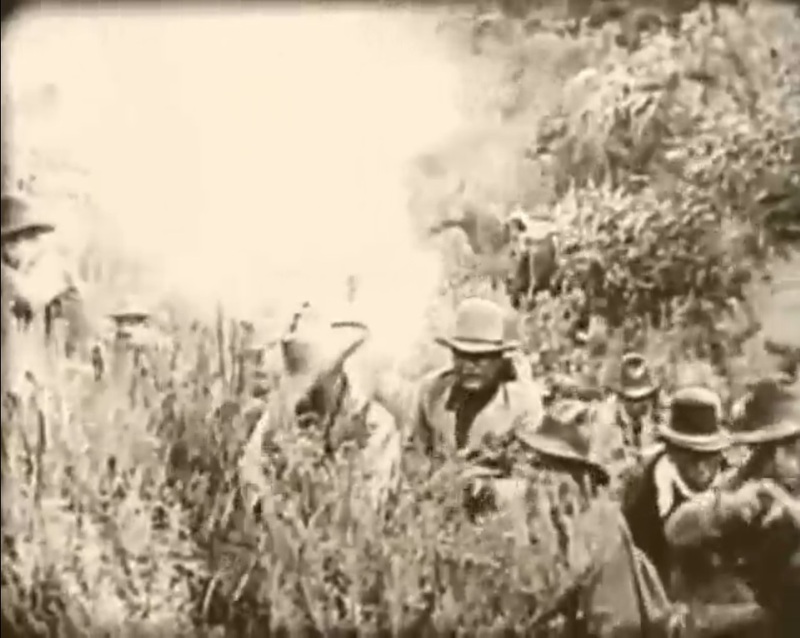 Finally, before anyone asks, “where’s ‘The Birth of a Nation,’” the answer to that is here.